Cruising on the Tidal Thames can be a most rewarding experience whether exploring the upper river or as the starting point to a cross channel passage. A safe trip requires a sound knowledge of the effects of the tidal stream, including the resultant currents and variable depths. The tidal Thames is a unique river, running over 90 miles from the sea to Teddington, with many varied challenges along its length. In the upper river between Putney and Teddington the channel is narrow with shallow depths, low bridges and many small recreational craft. The middle river, between Putney and the Thames Barrier, is very busy with tugs and tows, fast commuter ferries and day tripping boats all sharing the relatively narrow channel, which is tightly packed with the central London bridges. Once through the Thames Barrier the river widens and changes to a commercial port, with vessels becoming much larger and constrained to operating within the channel. 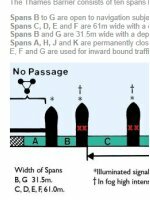 These differing challenges mean effective passage planning is vital and the information provided here should assist the recreational user in safely navigating the Tidal Thames. When entering the river from a lock, pier or berth do not cross in front of another vessel. 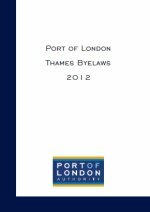 Navigating in restricted visibility is not an activity that the PLA recommends that any sport, leisure or recreational boaters should undertake on the Tidal Thames. No attempt should be made to get underway when visibility is less than 200m and should you already be underway during an outing, you should find a safe haven as soon as reasonably practical. Should the Master of vessel decide to navigate in restricted visibility, you must have a comprehensive understanding the International Regulations for Preventing Collisions at Sea, 1972 (COLREGs), in particular Part B (Steering and Sailing Rules) both Section III (Rule 19) – Conduct of vessels in restricted visibility and Section I (Rules 4 to 10 inclusive) – Conduct of vessels in any condition of visibility. Navigate at a safe speed to ensure effective action can be taken to avoid a collision. MGN 369 - Navigation In Restricted Visibility contains further guidance. Small vessels can also vastly improve their detectability by using AIS. An AIS transceiver can also assist small vessel crews in the early detection of ships, as well as showing names, call signs, speeds and headings of vessels in the locality to improve situational awareness. An 8 knot speed limit also applies in all creeks linked to the tidal Thames and the inshore area off Southend. The limit is advisory at Coryton and Thurrock when tankers are berthed. At times the wash, or waveheight, on the Thames can get heavy. The steep river walls reflect, rather than dissipate, the wash so it can be particularly rough at high water during busy traffic periods. The Thames is classified as ‘Category C’ and 'D' with waveheights of up to 1.2m and 1.5m, so vessels should be suitable for the conditions. 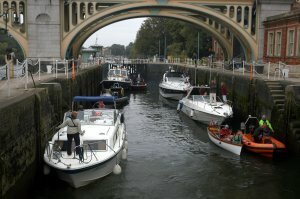 Ensure you have planned your passage; taken into account the tide times; made bookings with any locks; and checked the weather and ‘Fluvial Flow’ guidance. Check our Notices to Mariners page for anything that may affect your journey, such as river closures and bridge maintenance. Everyone on board a recreational craft navigating on the tidal Thames should wear a lifejacket. The river is cold and fast flowing and can be harsh and unforgiving. 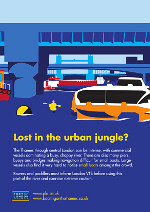 VTS can pass any pertinent navigational information to you too, such as river closures or bridge arch closures. Always be aware of traffic moving up and down the river and enter the tidal Thames only when safe to do so. We strongly advise all vessels to carry VHF, though VHF is only required for vessels above 13.7m. You should monitor VHF Channel 14 when between Teddington, through central London to Dagenham (Crayfordness). Below here, monitor Channel 68 until Southend Pier where Channel 69 then takes over. If there is no VHF radio on board, the person in charge of navigation of the vessel should report to the London Vessel Traffic Service (VTS) by telephone (0208 855 0315 west of Dagenham, 01474 562215 east of here) prior to entering the tidal Thames. Most chandleries sell VHF handsets, along with the ‘Ship Portable Radio Licence’ required for a VHF Digital Selective Calling (DSC) Handset. Contact your local chandlery for more advice on this. Note: An RYA ‘Short Range Certificate’ (SRC) is the minimum requirement to use a VHF or VHF DSC radio (unless It is an emergency situation when anyone may use the radio to call for help) as well as appropriate licenses from OfComm. Contact OfComm and the RYA for more information. The Thames Ring route uses this 4 mile section of the river Thames. It requires extra preparation and skill compared to the canals. You should ask for the advice of the lock keepers at either Brentford or Teddington regarding the timing of your passage. (See below contacts table) They will ensure that you get the maximum benefit of the tides. The river here and also down to Putney is very busy with rowers and paddlers. Take a look at our Rowing and Paddling pages of the website to become familiar with what to expect. The river is narrow with very little water in places, so plan your passage carefully. We suggest avoiding low water when navigating in this stretch of river. Low bridges present an additional hazard. If leaving Brentford and heading upriver to Teddington Lock, we suggest you do this on a rising tide. This will allow passage through the open half-tide barrier at Richmond, and mean you won't have to “punch” against the tide as you travel upstream. If you are travelling from Teddington Lock down to Brentford, we suggest leaving Teddington at High Water and travelling on a falling tide to arrive at Brentford around one hour later. This should enable a safe turn to LEFT (PORT) when entering Brentford Creek. 2 orange lights side-by-side mark aches which lie within the navigable channel. To the west of Putney, you should use the arch with these orange lights which is furthest on the starboard side. You can use arches not marked by these orange lights where depth and height allow. This is manned 24 hours a day and a fee is payable if using the lock. However, for around 2 hours either side of high water, the weir sluice gates are raised, allowing free passage of craft. Where possible, schedule your transit to pass through the barrier during this time. See here for more info. The river below Brentford presents a variety of challenges. Down to Putney is used extensively by rowers and paddlers. Take a look at our Rowing and Paddling pages of the website to become familiar with what to expect. The PLA Shop contains charts, bridges guides and tide programs to help you plan your passage. We suggest, particularly for your first journey through London, to plan your passage for the quieter traffic times. This tends to be early mornings on weekends. From around 10:00, the weekend passenger services begin to start. During the week, these begin much earlier. * TAKE CARE WHEN CROSSING THE RIVER TO LIMEHOUSE. YOU MUST NOT CROSS IN FRONT OF OTHER RIVER USERS. If you wish to take a more leisurely trip down to Limehouse and avoid the possibility of missing your window for locking through, we suggest you find a visitor’s mooring. Piers such as Putney Pier, Plantation Wharf, Imperial Wharf (Chelsea) and Chelsea Harbour Pier offer berths for you to moor up and wait for a more favourable tide, so you can be well rested and well prepared before coming through the busier part of the river. This would allow you to plan your passage with the tide down to Chelsea, wait for the next High Water and then have plenty of time to go though London to Limehouse. You can find details of visitor moorings using our ‘Interactive Map’ and ‘Facilities Directory’. Upstream transits from Limehouse to Brentford or Teddington have slightly more relaxed time and tide constraints, due to High Water at Teddington being 1hr after High Water in central London. Leave on the ‘flood’ tide, allowing sufficient time to get to Brentford or Teddington before the tide turns. The traffic in central London can get very heavy, particularly at peak times in the summer months. The areas around the Tower of London and Westminster / London Eye are especially busy, due to crossing vessels and sight-seeing passenger vessels. Avoid impeding commercial craft wherever possible. They can be difficult to manoeuver, take a long time to stop and may be confined to a small part of the river where there is just enough water for them. Take particular caution when near vessels navigating with the tide behind them. This makes the steering and stopping of large vessels even more difficult than normal. If you are navigating against the tide, be prepared to stop or give way to vessels coming the other way. Through central London, the majority of bridges have multiple arches to choose from. You should use the arch which is furthest on the starboard side, where depth and height allow. 2 orange lights side-by-side mark aches which lie within the navigable channel - these, particularly the centre arches, are used by commercial vessels. You can still use these arches provided you remain on the starboard side of the river and you don’t impede commercial vessels. Watch out for a white flashing light on the bridges. If it flashes, you MUST NOT USE THAT ARCH due to large craft or tugs approaching that arch. You must keep out of their way. They are restricted in their manoeuvrability due to their size, weight and the bridge arches. If you intend to head to the East of London passed the O2 Dome, click here for guidance for the Thames Barrier. There are a number of visitor moorings available on the tidal Thames. See our Interactive Map and List of Moorings for more information. Most yacht clubs, cruising clubs and marinas should be able to offer some moorings. minimum of one 12kg anchor, attached to a designated strongpoint by 5 metres of 6mm short link chain and 25m of 12mm rope. An AIS transponder (Automatic Identification System) is of a great benefit. An AIS transceiver can assist small vessel crews in the early detection of ships, as well as showing names, call signs, speeds and headings of vessels in the locality to improve situational awareness. For some vessels, particularly narrow boats or boats that were designed for canals and non-tidal rivers, the distance between the water and vents, hatches or drains may be quite small. 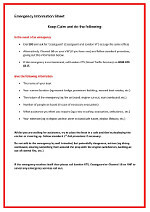 Safety Bulletin No.1 of 2012 was published following an incident where there was inadequate freeboard or safety clearance. The tidal Thames is considered to be a Category C waterway, where wave heights of up to 1.2m may be encountered. Vessels should be suitably prepared to meet these conditions. Through hull fittings, vents and exhaust outlets should be positioned as high up as practicable on narrowboats to meet the conditions likely to be encountered. Where through hull fittings, vents and exhaust outlets cannot be moved to a safe location consideration should be given as to whether the vessel is suitable to navigate on the tidal Thames. Where modifications have been made, such as the extensive use of double plating, it is important to check sufficient safety clearance remains for the vessel to safely navigate. Lifejackets and other safety equipment should always be provided on board vessels navigating on the tidal Thames and it is strongly recommended that lifejackets are worn at all times when on deck. It is important to ensure that the engine and controls of the vessel are in a good state of repair. Following a series of easily available incidents where mechanical breakdowns were the cause, the PLA published Safety Bulletin No.3 of 2014. 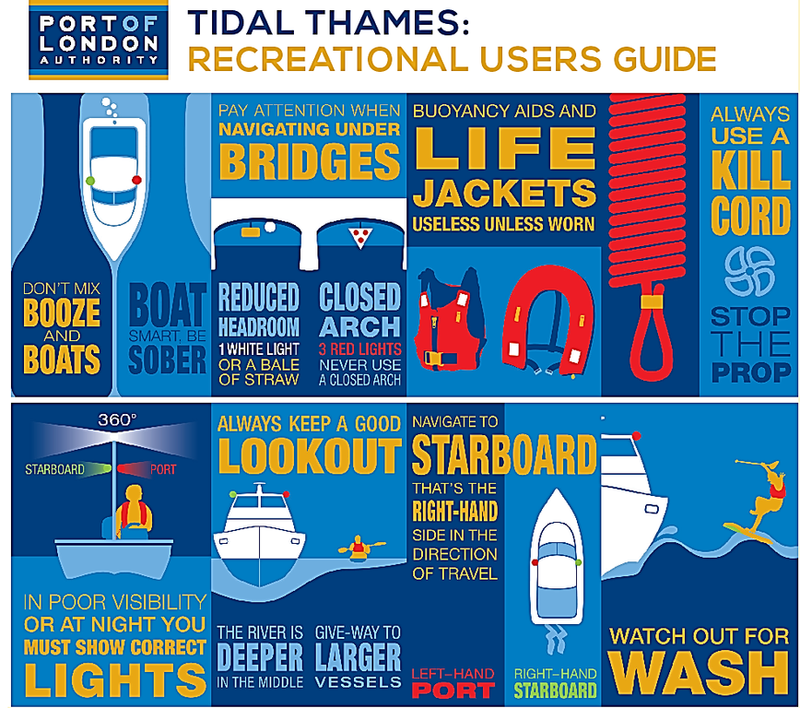 Although there is not a legal requirement for the person in charge of a recreational craft or ‘pleasure vessel’ to have a formal qualification, the tidal Thames is not for novice or inexperienced people. A good degree of boating knowledge and experience is needed before venturing on to this complex and challenging river. vessels that are hired or chartered are not considered to be pleasure vessels. a vessel carrying more than 12 passengers is not classed as a pleasure vessel, but would come under the definition of a ‘passenger vessel’. 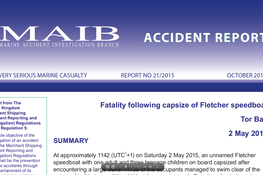 The vessel and the skipper would then require appropriate licences from the Maritime Coastguard Agency (MCA). Contact your local MCA office for further details.